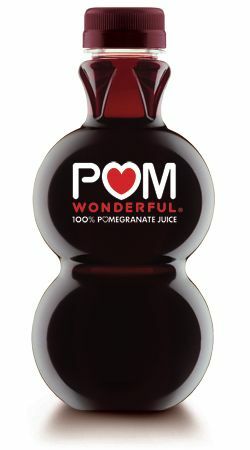 I first tried POM Wonderful’s pomegranate juice when it was relatively “new” to the market a few years ago. It was really bitter tasting and came on way too strong. So when POM Wonderful emailed me to see if I was interested in trying a free sample of their pomegranate juice, my initial instinct was to say no. But then I decided to give it a second chance. Unfortunately the box of juice languished in my fridge for a few weeks. In the meantime, we went to India and tasted freshly squeezed pomegranate juice. Bless the heart of the person who shelled all of those pomegranates for that one glass of luxurious sweet, tart and refreshing glass of juice. Freshly squeezed tasting POM Wonderful is not. BUT the bitter, concentrated juice of a few years ago it is not either. Their pomegranate juice is a little tart and sweet (as pomegranate should be) and very refreshing. I could almost feel it antioxidizing my skin as I drank it. Although, I think it’s best enjoyed in a smoothie rather than on it’s own. hmmm.. I remember POM to be strong and bitter flavored too. Never dared to try it again. May be it’s time for re-tasting. You were missed and it is wonderful to have you back. I have never had POM straight – but have used it in vinaigrettes (sub some of the POM for the acid) and it adds a complex yet subtle flavour. POM is owned by the very same company that pimps Fiji water. They supported the dictators of Fiji and are a shameful bunch of thugs. Please do consider whether you want to be giving money to such a terrible company.